IF THERE IS such a thing as a rising superstar in the apple world, it is Honeycrisp. This variety has been grown commercially for just 20 years but is fast becoming famous for its distinctive texture — crispy but yielding, neither hard nor soft, and full of juice — and flavor that veers more to the sweet than tart. A good Honeycrisp virtually explodes in your mouth, and leaves both apple lovers and growers across the country yearning for more. But a good Honeycrisp can be hard to find. The trees are susceptible to several diseases, for one thing. Honeycrisps do not always store well, either. The fruit’s color is highly variable, from almost solid red to pink-striped green. Its flavor, too, can be uneven, depending on where it is grown. But a good Honeycrisp is a sensory sensation, worth the trouble for the grower to cultivate, worthy of the apple lover’s devotion. 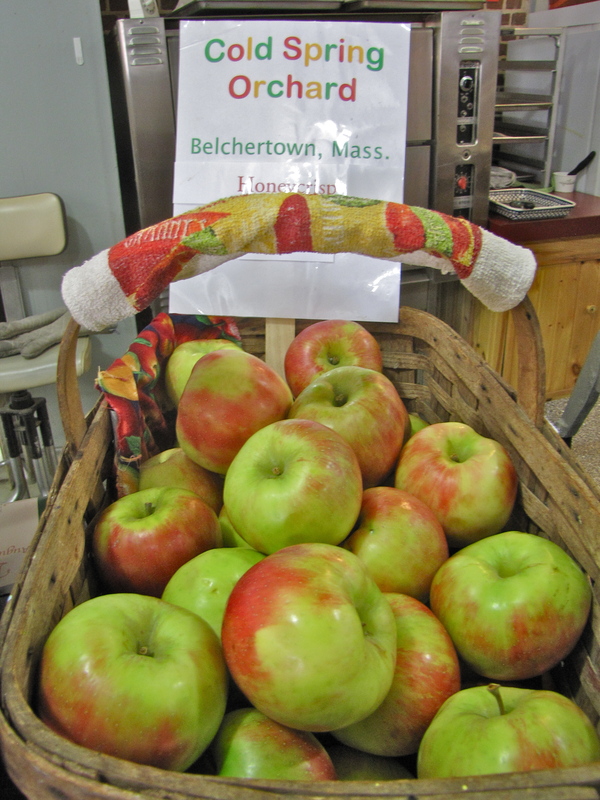 The good news for New Englanders is that Honeycrisp generally grow well in McIntosh country, preferring our hot summer days and cool autumn nights. They usually ripen in mid-September, but this year the crop is early, and they have already been available at a number of orchards. If you have been fortunate enough to have eaten an outstanding Honeycrisp before (or if you have never had one), now is the time to find them fresh from the tree. If you have tasted one and don’t understand what all the fuss is about, give it another try. Once you have bitten into a great Honeycrisp, your taste buds will never be the same. DESPITE ITS EXCELLENT eating qualities, Honeycrisp almost never came to be. The original Honeycrisp tree, planted at the University of Minnesota in 1961, was discarded in 1977 after suffering damage over the winter, leaving just four unnamed offspring behind. These, too, were nearly thrown away, seen as unexceptional (although remarkably there was no mention of flavor and texture in their initial evaluation). But at the last minute, apple breeder David Bedford, who came to the university in 1979, reversed his original order to destroy the young trees, deciding to give them another try. The first mention of Honeycrisp’s flavor and texture were not recorded for another four years, but once he finally tasted the fruit in 1983, Bedford realized Honeycrisp was an exceptional apple. Honeycrisp was first thought to be a cross between Macoun and Honeygold, but DNA testing proved otherwise. 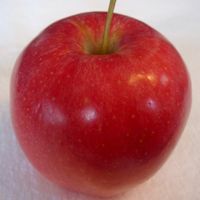 Now, its parents are listed as Keepsake, another apple developed at the University of Minnesota in 1978 (which has Northern Spy as one of its parents), and “unknown.” Honeycrisp’s other parent has never been identified, and probably never will be; possibly it is an unnamed seedling that was discarded like the original Honeycrisp tree. 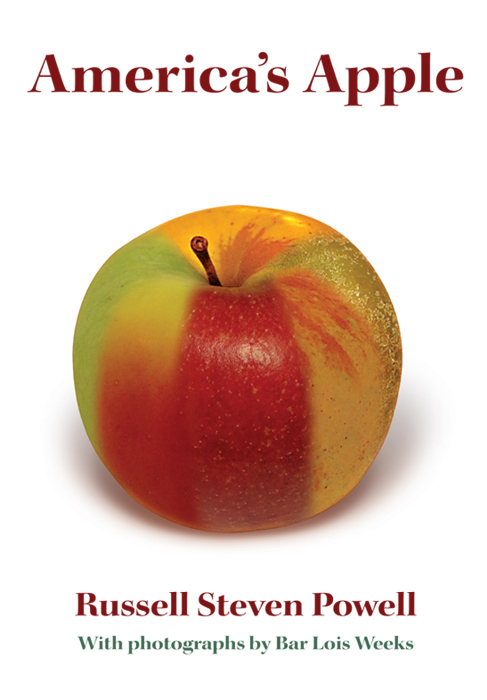 The fascinating story of Honeycrisp’s history, as well as the changes it has spawned in the apple industry (including a controversial trend to trademark new apple varieties as a means to control their quality and quantity) is told in the book America’s Apple by Russell Steven Powell, with photographs by Bar Lois Weeks. To learn more, including how to order, visit americasapple.com. Who makes the best apple cider donut? THE QUESTION of who makes the best cider donut inspires considerable debate and some controversy. These humble, cake-like orbs are nearly as high in demand as the freshly picked apples filling the bins or hanging from the trees at many orchards. Why do these apple-infused donuts provoke such fierce devotion, and what is the secret of their success? We have sampled cider donuts from dozens of orchards around New England and can vouch for their nearly universal appeal, although no two are alike. 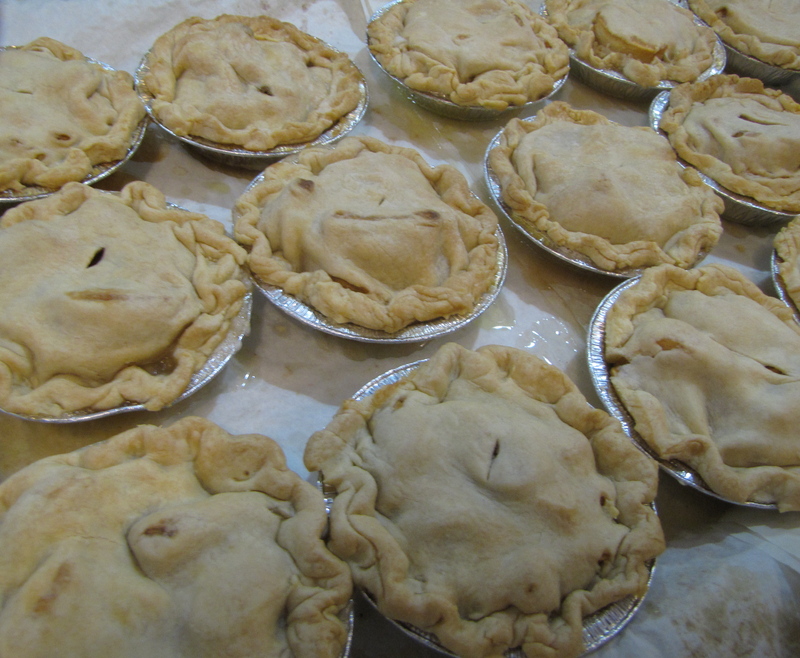 They are all made with cider and very little shortening and come in two varieties: plain and sugar-coated. The latter are often mixed with cinnamon, as is the batter, giving the donuts their distinctive, lightly spiced flavor. That flavor is equally influenced by other spices added to the batter, notably nutmeg, but we can offer no further insight, as orchards guard their ingredients and proportions like state secrets. Their texture is what further separates the very good from the truly exalted cider donut. Some are heavier, some a little lighter, but beauty, in this case, is in the taste buds of the consumer. Cider donuts inspire great loyalty: the best ones invariably are those made at one’s local orchard. For many, it is love at first bite. Cider donuts are known primarily in the Northeast, and their popularity is staggering. Many orchards have trouble keeping up with demand, especially on fall weekends, and people will endure long lines to satisfy their appetite for this subtly sweet treat. 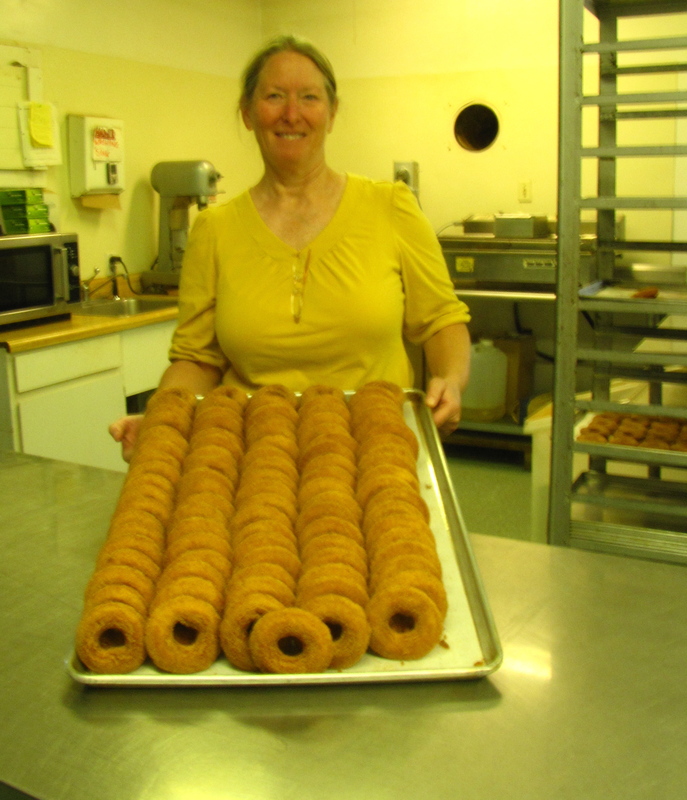 The cider donuts made by Atkins Farms in Amherst, Massachusetts, were once named one of the top ten donuts in America by a national food magazine, and on fall weekends they make upwards of 10,000 per day. We will have Atkins Farms cider donuts at our booth in the Massachusetts Building at the Eastern States Exposition (“The Big E”) daily starting this Friday, September 14, through Sunday, September 30, but you can find great cider donuts at your local orchard as well. After all, that’s where they’re the best. THIS RECIPE comes from Stephanie Waite of Westward Orchards, Harvard, Massachusetts. We’ve tried their cider donuts — it’s in our job description — and they’re outstanding, too. Preheat oven to 350°F. In a large mixing bowl, place donut pieces. In a separate bowl combine remaining ingredients except apple. Pour mixture over donuts and let sit 20 minutes. Meanwhile, core and chop the apple and add to donut mixture. After 20 minutes, pour this into 9″ x 13″ baking dish and bake for one hour or until set. IN ADDITION to cider donuts, we will have fresh apples from a number of Massachusetts orchards at our booth at the Big E, plus apple crisp and pies made by Marge Cook of Cook’s Farm Orchard in Brimfield, fresh cider from Carlson Orchards of Harvard, apple butter and preserves from Bear Meadow Farm in Colrain, and the book America’s Apple, by Russell Steven Powell, with photographs by Bar Lois Weeks. Both Powell and Weeks will be staffing the booth and available to sign books and talk about apples. 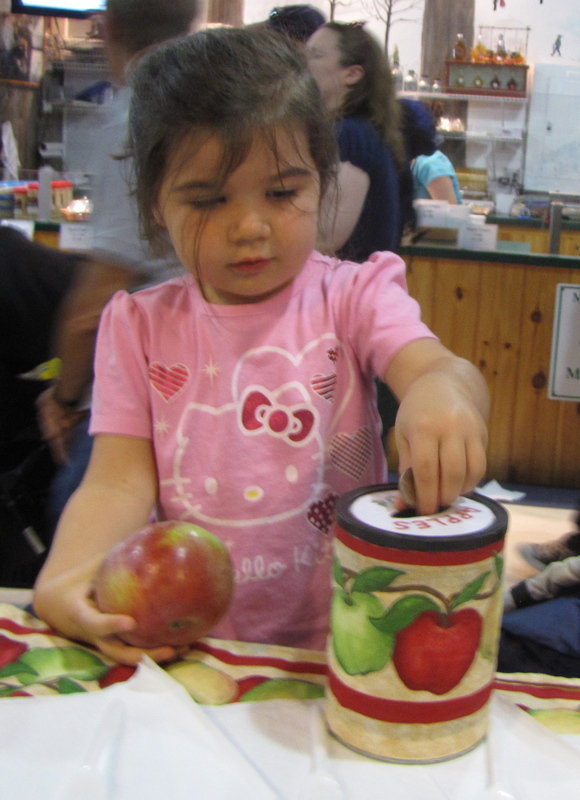 We will also have recipe cards and brochures about New England orchards and apples. Stop by and say hello, grab a bite, and learn more about America’s most famous fruit. THE 2012 NEW ENGLAND APPLE CROP was celebrated around the region yesterday, as state officials in Connecticut, Maine, Massachusetts, New Hampshire, Rhode Island, and Vermont visited orchards to meet with growers and sample fresh-picked apples. In Massachusetts, Governor Deval Patrick and the state legislature declared September “Apple Month.” Officials from the Department of Agricultural Resources visited Honey Pot Hill Orchards in Stow, Bolton Orchards in Bolton, and Westward Orchards in Harvard to present signed copies of the declaration. In Connecticut, Agriculture Commissioner Steven K. Reviczky read Governor Dannel P. Malloy’s proclamation of September 5, at New England Apple Day at Belltown Hill Orchards in South Glastonbury. In Rhode Island, Ken Ayars, Chief of Agriculture, presented a similar proclamation at Appleland Orchard in Smithfield. 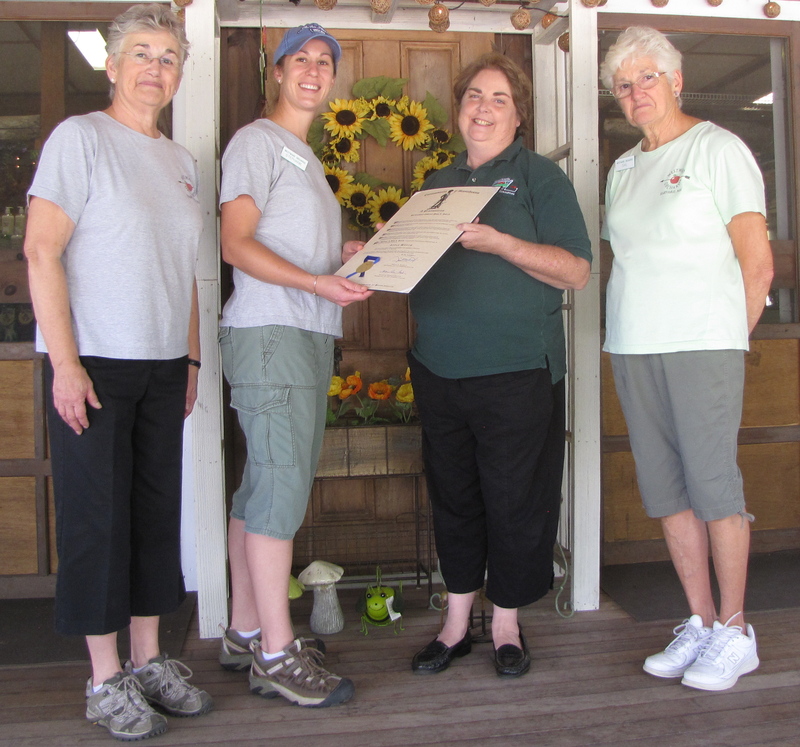 State officials in New Hampshire gathered at Apple Hill Farm in Concord to show their support and present their New England Apple Day proclamation. The 2012 New England apple crop is expected to be smaller than normal due to damage inflicted by a spring frost and scattered hail in mid-summer, but over all the harvest looks strong and is off to a robust start, a week or more ahead of schedule. 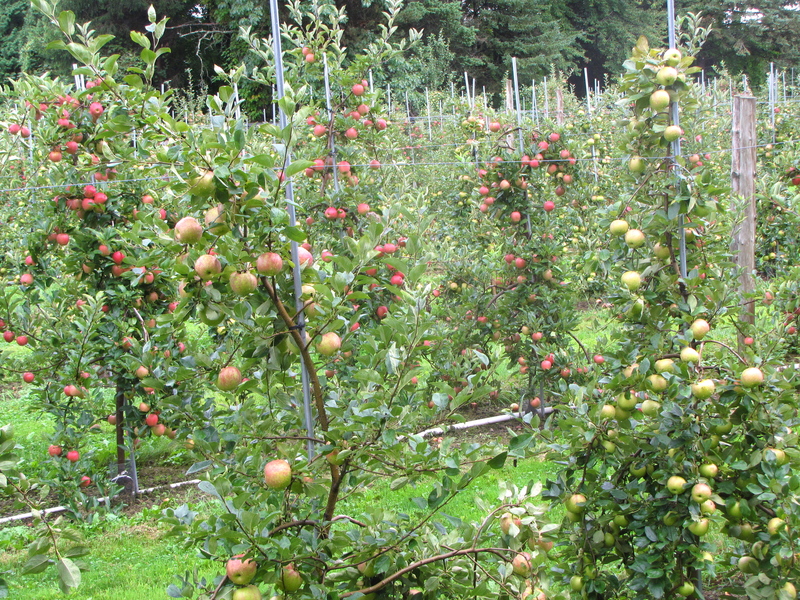 There will be plenty of fresh apples for picking throughout the season. Varieties like McIntosh, Cortland, Gala, and Honeycrisp are already being picked at many of the region’s orchards and should be available at pick-your-own farms this weekend. Call ahead to see what your favorite orchard is picking, or visit New England Apples for a listing of orchards throughout the six-state region. Gala has become one of the most widely grown apples in the world since it was introduced from New Zealand in 1934. It has a conical shape and red-orange coloring with yellow striping, and it often turns a deeper color late in the season and in storage. Gala is a sweet, crunchy apple, and juicy. Its flavor has hints of pear. Gala is well suited for both fresh eating and cooking, and it is ready for harvest in many orchards now. Gala derives its genetic heritage from Cox’s Orange Pippin, an English apple dating back to 1825, and both Red and Golden Delicious. One of its offspring is Jazz, a managed variety introduced in 2000. Managed, or club, varieties, are now the norm for new apples developed around the world. Growers can only plant these varieties if they are licensed to do so. The goal of managing varieties this way is to maintain quality and limit production, and return more revenue to the people and programs that develop them. While this can prevent a popular apple from being over-planted, it means that consumers may not find certain new varieties in their local orchard. HERE’S A RECIPE for Galas or other New England apples adapted from the kitchen of Roy Palmquist. For a healthier version, substitute plain yogurt for the sour cream (try the Greek kind for extra creaminess), or applesauce for all or part of the butter. Cream together butter and sugar. Add eggs and vanilla. Stir in dry ingredients and sour cream, and mix well. Spoon half the batter into a greased 9”x13” pan. Layer apple slices on top and sprinkle with half of topping mixture. Repeat the three layers: batter, apples, topping. Bake 45-50 minutes, or until a toothpick comes out clean. Mix together confectioners’ sugar and almond extract. Add just enough milk to make it moist enough to drizzle off a spoon. While cake is still warm, drizzle with icing. IT TAKES GREAT EFFORT and a little luck to bring an apple crop to the crescendo of harvest, but visiting an orchard teeming with apples in September and October is a treat for all of the senses. 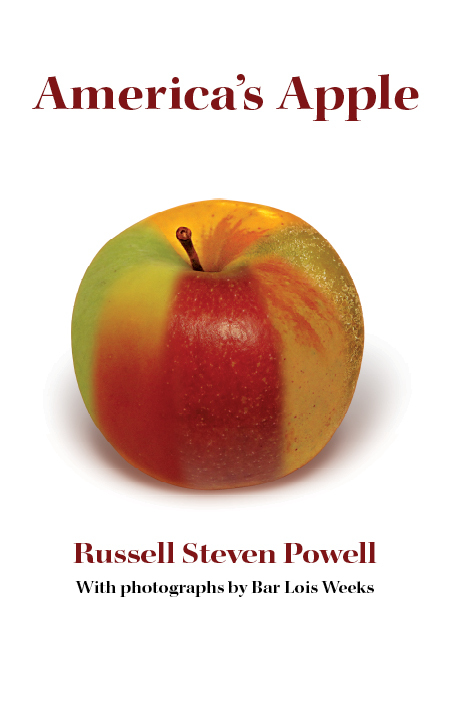 Read about how about apples are grown and the challenges growers face as they guide their crop from spring bloom through harvest in America’s Apple, a new book about apple growing in the United States by Russell Steven Powell. Powell, who has worked in the apple industry for the past 16 years, visited more than 50 orchards across the country gathering information for the book, and interviewed some of the nation’s leading apple researchers. The hard-cover volume features nearly 50 full-color photographs by Bar Lois Weeks, plus a photographic index of 120 apple varieties grown in the United States.